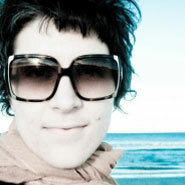 Susan Jane Murray, one of my favorite food bloggers, wrote the phrase “dining al desko” in one of her blogs. I liked it, and am using it as inspiration. I hate eating at my desk. But I work at a desk. And I need to eat. And sometimes, the two need to happen at the same time. This is one of my favorite quick and tasty meals to eat at my desk. I like to use chopsticks when I’m eating and working because it makes me think more about eating and chewing and I do it more slowly, instead of mindlessly scarfing down the food while working on a project. Plus chopsticks are fun. And coworkers find it amusing and quirky. This recipe requires just a little prep work at home, but it is fast and simple to throw together if you have the necessary elements prepared. Basic concept: cooked grain + hijiki + cooked vegetable. My favorite grain in this dish is broken wild rice. Broken wild rice is less expensive than full grain wild rice, but has all the same benefits – the grain is just broken. 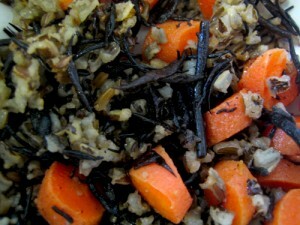 Wild rice isn’t really rice at all, it is a grass native to North America. It is very high in protein, is a great source of complex carbohydrates, and is high in fiber. The flavor is earthy, rich, and nutty. 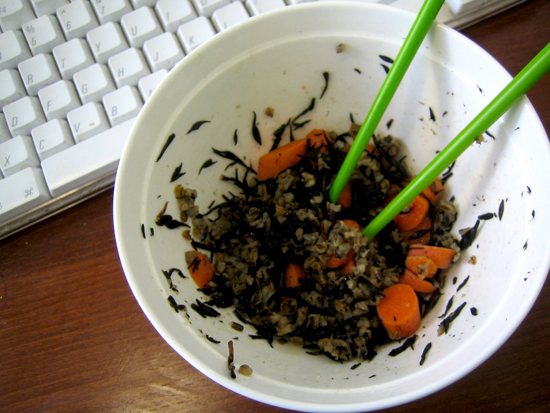 I love it combined with hijiki – the textures are great together, and the nutty earthy flavor of the wild rice balances well with the saltiness of the seaweed. Hijiki is one of my favorite sea vegetables; I often soak up a big batch of hijiki, or other sea vegetables, and keep them in the fridge for whenever I want them. Sea vegetables are a great addition to a diet – they stimulate the thyroid, are high in fiber, help balance healthy gut bacteria, and are a good source of calcium and iron. Combining sea vegetables with other vegetables is not only delicious, but it also helps the body absorb all their readily available nutrients! In fact, vitamin C helps the body assimilate both calcium and iron, so carrots make the perfect addition to this dish. Plus, their sweetness rounds out the overall flavor effect. If I know I want to eat this, I’ll usually steam up some carrots the night before while I’m steaming up my dinner veggies. No carrots? Fine! Any veggies will work, whatever you have leftover that you want to use up: green beans, asparagus, green onion, brocolli, squash, sweet potato, zucchini, whatever. The final touch is a bit of flax oil, for healthy fats and good omegas. Sesame oil is really tasty too, if you can tolerate sesame. Do you know that a little healthy fat helps the body absorb vitamin C? What a marvelously balanced dish! The end result is a high fiber, super nutritious, wonderfully satisfying bowl of goodness. And it will leave you feeling much better than corn chips from the vending machine or leftover bagels from yesterday’s meeting. Eat greedily, either cold or warm. Feel energized, alert, and awesome!